The tone of news stories about food waste shifted a week or so ago. For nearly a month, news outlets and bloggers seemed so overwhelmed with the size of the problem, that few bothered to dig deeper. But, those rehashed stories on the amount of food wasted in developed nations are now becoming more nuanced. According to the USDA, the annual cost of food waste for an average family of four in the United States is $2,275. My interested in waste management was piqued by an investigation onthe life cycle of our food waste once it has been collected. This story focuses on a community that already requires food waste to be separated from other waste. For those who need to see the magnitude of food waste we generate each week, call your local waste management centre. Many waste and water treatment plants offer tours for the public. Massachusetts is leading the way in the United States, with two approaches to reduce the amount of food that ends up in land fills. The state now requires businesses in the food industry to compost their organic waste, the goal is to expand this requirement to every home in the state. But there is a more interesting approach to managing food waste that might be even more efficient. A province in Korea has implemented a mandatory “pay-as-you-throw” system charges households for throwing food in the bin. What appeals to me about this approach is that economic cost of wasting food becomes more transparent and big wasters pay more for being wasteful than those who are frugal. And, finally, it looks like the plastics industry is jumping into the food waste debate and looking for ways to help reduce food waste with better packaging. This report has me wondering about other landfill issues, but we work hard to reduce packaging waste at home too, so I may be a bit biased. 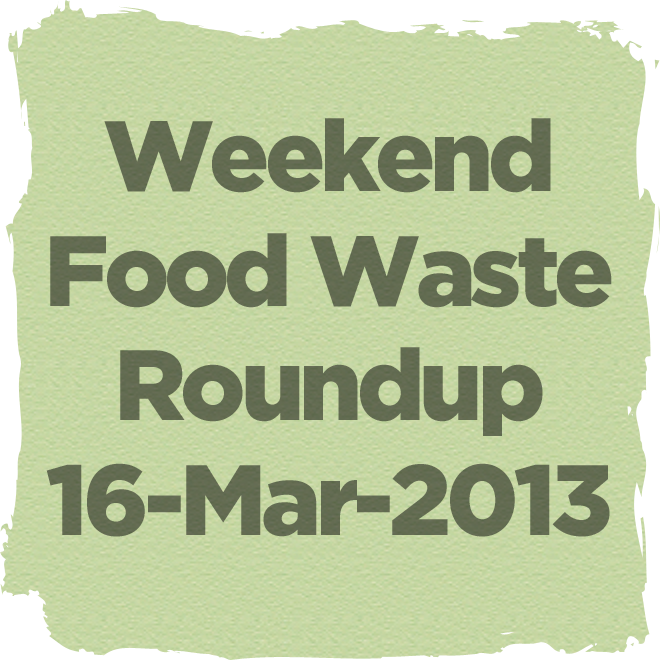 This entry was posted in Weekend reading and tagged food waste, news, roundup, sustainability by Bonnie Lee. Bookmark the permalink. The “pay as you throw system” sounds great–reminds me of the system in all-you-can-eat sushi restaurants, where you pay extra for the food you order but DON’T eat. I am beginning to see more articles and blogs on your topic; I feel this idea is catching on much more in the past year. Keep it up! Jean-Francois also found a few articles about places in Japan that are starting to charge people who leave food on their plates. The two of us eat so little, compared to many here in the United States, that going to a restaurant has become uncomfortable. Sharing one appetizer and one entree between us is not a popular option here, as it was in Japan. But maybe things are changing. I sure hope so. The all-you-can-eat, supersize-me attitude to meals these days misses the whole point of eating for the pleasure of good food–quality and nutrition. Mind you, I am probably not popular then, ’cause I’ve been sharing appies and meals with friends and kids for the last 30 years–I am just not willing to compromise my diet/health over absurd portion sizes. I like Korea’s approach. Here in Texas, my waste fee is mandatory (and sets me back $250/yr) even though I don’t use it (we compost, reuse, recycle) and it pains me to see all of my neighbors’ bins and bins of recycling and green waste going into the landfill truck. I have “saved” many-a-bag of leaves and grass-clippings from that fate by moving them from their curb to my yard, yet I’m still required to pay the same for those who don’t care because it’s the law. Hit people in the pocketbooks for rampant waste, reward those who don’t waste. Not so easy to implement, though real change might actually start in this way. In Japan, we had to buy three different types of disposal bags at the market: one for glass, one for plastic, and one for burnables. The fee on the bags was a municipal tax meant to put larger costs on more wasteful households. We’d b)*&% about the bags a lot, but now wish Los Angeles would do the same. Our apartment complex combines water and trash services into one bill. The amount we owe is determined by dividing the total amount used by all apartments in the building by total residential square footage and then multiplying that by each apartment’s square footage. It is not truly fair, since we use less water and generate less waste than most. It makes the Japanese approach seem more reasonable in many ways.